Following the flagship concept in Milan, Larte Dubai is a new Italian opening that offers an all-day dining experience combining a counter service ‘caffé’ and full-service ‘trattoria’. Living by the philosophy of ‘bello, buono e ben fatto’, meaning ‘the beautiful, the good and the well-made’, the concept is a model example of simple, honest Italian excellence and hospitality. The menu features both traditional Italian dishes and lighter Mediterranean flavours. Serving breakfast, lunch and dinner, guests can choose from a selection of small Antipasti plates perfect for sharing or more substantial main courses. The menu offers a wide selection of vegetarian, vegan, seafood and meat options. Call 04-2400441 or see www.larte.ae . Jebel Ali Recreation Club, one of Dubai’s oldest and most popular leisure venues by Nakheel, has officially reopened after its extensive refurbishment, which saw the club transform into a new recreational, dining and entertainment destination in Jebel Ali Village. Spanning at 500,000 sq ft., the Club offers a number of unique dining experiences including C House Milano, Ship’s Wheels, Andalucia Tapas, Seafood Kitchen and The Club House, in addition to recreational facilities like tennis, squash and a swimming pool. The Club is also due to open its first Reel Cinema – making it the perfect venue for families looking for a mix of leisure and recreation. See on social media @JebelAliClub. Created by the forward-thinking chef Izu Ani, IZU Brasserie located in Le BHV Marais, City Walk is a humble, informal dining spot with the soul of a traditional brasserie, serving simple dishes inspired by Mediterranean culture. IZU Brasserie embodies the same characteristics as its namesake, chef Izu, a place where guests are friends, gathering together in an intimate and welcoming environment, experiencing and sharing good food together. The simple Italian menu has been designed using the highest quality ingredients to create consistently good food. The smell of freshly baked croissants and bread fills the air at IZU Bakery, a lively and friendly neighbourhood Boulangerie. The Bakery’s all-day breakfast menu offers a taste of home and includes warm savoury breakfast crepes with a variety of fillings, the signature IZU burger and eggs served in every way imaginable. Visit www.lebhvmarais.ae/en/izu/. Amwaj Rotana Jumeirah Beach, Dubai has launched a brand-new lounge, as an extension of its Italian restaurant Rosso. 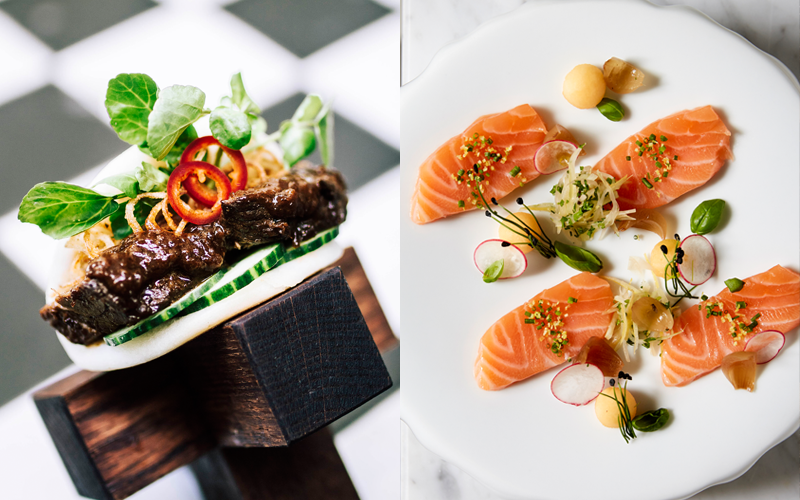 Fumo Lounge will bring together the best of the hotel’s signature restaurants. The menu was designed based on the idea of sharing concepts in a casual setting. Guests can enjoy sushi and new style sashimi from Benihana, Lebanese dishes with a modern twist, wood-fired flatbreads from the host kitchen, Rosso, and more. The design of Fumo lounge is laid back chic with an Arabesque feel. Seating just over 100 guests in a relaxing ambience, guests can also enjoy a grape mint or a double apple with bubbles, hops and more. Fumo Lounge by Rosso is now open from 5 pm until 1am on weekdays and from 5pm until 2am on weekends. Call 04-4282000.
International steakhouse, STK, opens its doors in Dubai this December representing the first Middle Eastern outpost. The high-energy dinning and drinks venue offers the ultimate blend of food-meets-party, bringing an all-new experience to Dubai. Serving quality USDA prime beef, STK steaks are famous for their big flavours. Offering a wide selection of cuts, choose from smaller fillets and tender striploins to such larger cuts as the Ribeye, T-bone or Tomahawk. Aside from steak, menu items include the ‘Lil’ Brgrs’, made with USDA beef and STK’s special sauce, ‘Soft Shell Crab Sliders’, ‘Hotate Scallop Carpaccio’ from the Raw Bar, ‘Passion Fruit Miso Black Cod’ and delicious ‘Braised Beef Short Rib’, paired with a side of ‘Mac&Cheese’ or ‘Parmesan Truffle Chips’. For more information, contact reservations@stkdubaijbr.com. Rockfish, the Mediterranean seafood restaurant at Jumeirah Al Naseem has launched a new Lazy Lunch, which takes place every Friday from 1 – 4pm. With sand in your toes, fresh seafood, refreshing drinks, soft beats and a chilled out vibe – all complete with Burj Al Arab views, the Rockfish Lazy Lunch comprises four courses. The first is unlimited crudo such as mussels, clams, Alaskan king crab, razor sheels and smoked and cured salmon, followed by Tasmanian salmon crudo, yellow fin tuna crudo, sea bass crudo, Mediterranean garden salad, cherry tomato tartare, wild mushroom risotto with green asparagus all served at the table. For the third course, enjoy buckets of garlic prawns, mussels and clams, a Seafood mixed grill, baby chicken and oven braised Australian short ribs, served with a selection of sides for the table. If you have space left, there will be four desserts saved on the table, including a strawberry and cream cheesecake. Priced at Dhs350 with soft drinks, Dhs450 with house beverages, and Dhs175 for kids below 12 years. Call 04-4323232 or e-mail restaurants@jumeirah.com . Recently opened, BB is designed to give guests a sense of freedom to create their own experiences based on single-plate meals of baos, bowls, salads, grilled items, and sweets. Elements of the East are found throughout the menu, drawing on fresh, simple ingredients combined in well-conceived, accessibly priced dishes for a range of palates and budgets. Stand-out menu items at BB include super green hummus, cauliflower popcorn, and caramelised Brussel sprouts for veggie lovers, while carnivores will appreciate grilled lamb and Wagyu beef skewers as well as bang bang chicken and duck bao. Call 04-4074444 or e-mail hello@thisisbb.com . This month at St. Regis Dubai, the festive Winter Garden Market is back and will occupy the property’s garden area. Transformed into an enchanted winter wonderland, glistening with dazzling lights and beautiful festive-themed décor, experience the holiday magic as the Winter Garden Market comes alive with entertainment and themed activities for everyone to enjoy. Showcasing an impressive range of retail and unique food stalls, combined with a unique line-up of children’s activities and attractions, the Winter Garden Market invites guests to get into the festive spirit from 5pm -11pm from Sunday –Thursday, and from 3pm -11pm on Fridays and Saturdays, with free entry for all. Call 04-4355577 or e-mail ahc.dining@marriott.com. If you enjoyed this article, you may like this story on the new Dilmah tea lounge at the Pullman Dubai Creek City Centre.